I am often asked “Where shall I go when on Holiday in Scotland” to be totally honest I could probably list dozens of top tens, so I sat down and thought hard about this and changed my mind many times, in the end I written the first ten that came to my head and wrote about them below. Everyone is different and I would love to read your comments below or you can contact me and write down your top ten to feature on the Holiday Scotland website or Scotland Info. So here goes, my top ten places to visit and do when visiting Scotland. 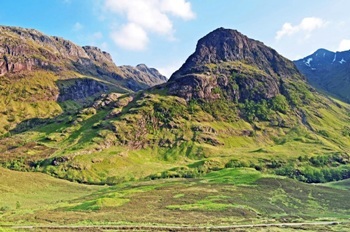 When I drive through Glencoe it sends a shiver down my spine not only the excellent scenery, but the whole feel of the place, the history and the many stories you have read about the Glencoe massacre all come to life in this magical place. Every time I have driven through the valley it feels different every time, the weather can make a large difference, from hauntingly mysterious with its hanging clouds and mist, to bright and wonderful with the hills alight with bright sunshine, whatever the time of year its always worth seeing, but take your time and stop to take in this magnificent valley, it is also worth mentioning that you also have Glen Etive on the south end of Glencoe another great drive and worth visiting when in this area. Skye is a wonderful place to visit, with many great places to see, the whole Island is a wonder and never stops surprising me. But the black cuillins are a wonder of their own, the first time you visit these Mountains in Scotland you can’t believe you are in the UK, nowhere else compares to this place for sheer magnificence. Many climbers visit these great mountains all year round challenging themselves, and many will tackle the full traverse that has become one of the ultimate mountaineering experiences in the UK. But it’s not all about climbing just taking in the scenery is breathtaking, One of the best places to view the Black Cuillins is from Loch Coruisk, you can either take a boat trip from Elgol or walk from Sligachan, personally I recommend the Boat trip from Elgol, its much safer and the views when sailing towards these great mountains are stunning. Skiing on the Cairngorms is one of Scotland premier ski resorts during winter, with the nearby Aviemore acting as a base, a winter Holiday in Scotland is a must. There are great facilities in the area and lots of places to hire equipment if you don’t own your own, Not only does it appeal to the Skier and Snowboard enthusiast it is also an excellent place just to take in the winter scenery, you can view the winter activities by using the Cairngorm mountain railway that takes you to great viewing areas with restaurant facilities to have a lovely warm drink whilst you enjoy your time up the mountain. definitely a must if you want to spend some time in Scotland during the winter. The road to the isles drive is one I always enjoy when in the area, no matter how many times I drive it I find something different every time, the journey starts from Fort William and ends in Mallaig, with stunning views over the sea to the islands of Muck, Rum, Canna and Eigg, and also many Lochs to view including loch nan uamh (one of my favourites), along the drive you are also welcomed by stunning white sands and green forests leaving you a contrast you will never forget, Other very famous locations on this drive are Glenfinnan where you can see the Bonny Prince Charlie monument and of course the now very famous Harry Potter bridge Glenfinnan Viaduct, I highly recommend this drive to anyone, but if you don’t drive you can also take this lovely journey by train on the West Highland Railway or take the motorbike like our friend Alan did, he wrote a fantastic travel report about it. Well what can I say about Loch Ness in Scotland one of the most famous visitor attraction in Scotland, part of the Great Glen fault south of Inverness, its sheer size is amazing and there are many places to visit all around this great Loch, a great way to see this Loch is by boat with Jacobite cruises offering some great trips sailing down the Loch from Inverness, if you prefer to drive around the Loch I recommend a great stop at Dores beach at the North end of the Loch, a great place to view this great expanse of water with a lovely pub called the Dores Inn where you can have a great meal whilst looking for the Loch Ness Monster. other places to visit are Drumnadrochit where you will find the Loch Ness Expeditions, Urquhart Castle and Fort Augustus, these are just a few places to enjoy but I am sure you could also add a few more. Highland Games in Scotland is an event I feel everyone should witness when visiting Scotland, there are many games to visit during summer. The games are a way to celebrate Scottish Culture and heritage and among these events you will find everything from Scottish Dancing to Bagpipes and the traditional games like the caber toss, hammer throw, weight over the bar and other sports that have been part of Scottish folk law for many years. The Cowal Games is one of the largest held every year and definitely worth a visit you can find this highland games in Dunoon and is held every August, but you will find many smaller games in other great locations in Scotland, it’s something I love to watch and gives me much pleasure every time especially if the weather is kind. Eilean Donan Castle in Scotland is an easy recognisable feature on many shortbread tins all over the world, this iconic image is a fantastic place to visit and is surround by some of Scotland’s greatest scenery and probably one of the most visited attraction in the Scottish Highlands. It was partly destroyed during the Jacobite uprising in 1719, it lay in ruins for many years but was rebuilt and was opened to the public in 1932. You can tour inside the Castle and feel the history come alive as you stand amongst this stunning castles stone walls, there is also a nice visitor centre with a gift shop and restaurant, I find it difficult to pass Eilean Donan without stopping and taking a few pictures, definitely a must place to visit when on holiday in Scotland. It took me a few years to actually make this great drive across the Applecross peninsula, and when I did I wondered how it took me so long to do so, This drive is absolutely spectacular and one I will never forget, It’s not an ideal drive for a novice or nervous driver with its hairpin bends and very steep climbs it is definitely a challenging drive, but when you reach the top its opens up some of the best views I have ever witnessed in Scotland. In Scottish Gaelic Bealach na Bah means Pass of the Cattle with some gradients of 20% it is the third highest road in Scotland and reaches 2054 ft.
How can I describe the pure pleasure of visiting a Whisky Distillery, in fact I can’t because my senses of smell and taste differ from everyone I have ever visited, each one is different to the next from history to location, I find it difficult to pass a distillery without calling inside, for me it gives a great day out and experience, they all have their own traditions and stories to tell that gives you an insight of how Whisky is produced, most distilleries offer tours and some are free, there are different tours you can do from guided tour to a more informative tour where you do some nosing and tasting of different blends, you can find many distilleries around Scotland but two areas I can recommend are the Spey Valley that offers the Malt Whisky Trail and the Island of Islay that produces some of the great Scottish Whiskies. Put this on your list when on holiday in Scotland it’s a great experience. Glen Affric to me is one of the most beautiful glens in Scotland, located South West from Cannich it combines 4 of my favorite things about Scotland, Forest, Mountains, Rivers and Lochs all stitched together throughout this stunning arena of beauty. Autumn is a particularly good time to visit the glen just to see the fantastic change of colours of the landscape changing, but you can visit this glen any time of the year and discover a fantastic vista and array of smells to get your senses working. The Glen is a National Scenic Area and National Nature Reserve and is home to one of the largest Caledonian forest in Scotland with wildlife including Otter, Osprey and Red Deer, this really is a magical place and definitely a place to visit when on holiday in Scotland.